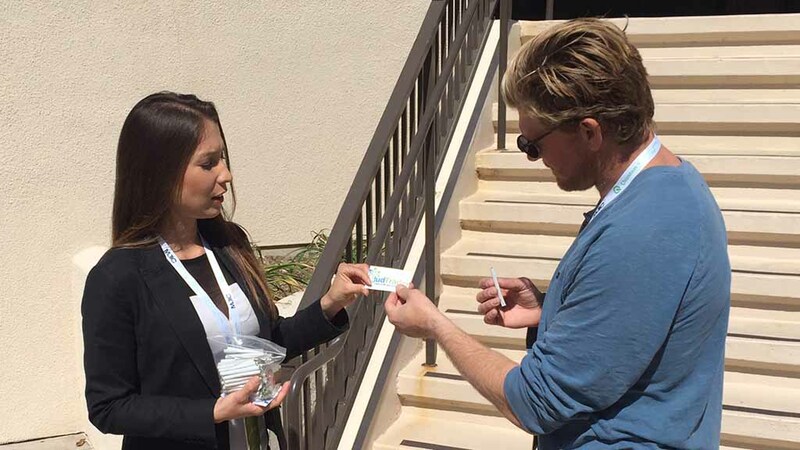 But according to San Diego’s Brad McLaughlin, CEO of an online medical marijuana marketplace behind the “pop-up” promotion, some of the hundreds of vendors need hugs the most. “Some of the biggest players in the marijuana industry pulled out of this event,” said McLaughlin of BudTrader.com, citing worries about their legal future in light of recent comments by Attorney General Jeff Sessions and a White House spokesman. Anti-marijuana sentiment in the Trump administration “kind of took the wind out of the sails” of the third annual California Cannabis Business Expo, which began Sunday and ends Wednesday with a business and investor summit. “They’re afraid to make any noise or be seen right now,” McLaughlin said. That’s one reason BudTrader decided to hand out free joints of a variety called Purple Train Wreck. Noting “a lot of negativity in American politics lately, especially towards medicinal marijuana, … we at BudTrader are all about positive energy,” McLaughlin said in a statement. “I asked myself ‘What would Jesus do?’ and that is when the idea for Blunts & Babes first came to me. It’s impossible to be angry when you are smoking a joint and hugging a supermodel. McLaughlin said social media — and some of the thousands of expo-goers — were concerned about police presence. But all was well after inquiries to local law enforcement. “They were extremely helpful,” he said. “Before the giveaway, we were advised that nonpatients may only possess less then 1 ounce of marijuana for recreational/personal use and that recreational users may gift or donate less then 1 ounce of marijuana legally,” he told Times of San Diego. Models were advised to ask for ID if someone wanting a joint looked younger then 35 or to ask for ID if they were unsure of someones age. Costing between $2.50 and $10 apiece, the pre-rolled joints were donated by a local advertising partner, he said. One accidental hug-getter was a San Diego police officer patrolling the event outside. The crowd cheered and the officer and his partner walked away smiling, he said.